A ceremony at Daikakuji, a Shingon temple in Kyoto, Japan. The Vinaya-Pitaka, or "basket of discipline," is the first of three parts of the Tipitaka, a collection of the earliest Buddhist texts. The Vinaya records the Buddha's rules of discipline for monks and nuns. It also contains stories about the first Buddhist monks and nuns and how they lived. Like the second part of the Tipitaka, the Sutta-pitaka, the Vinaya was not written down during the Buddha's lifetime. According to Buddhist legend, the Buddha's disciple Upali knew the rules inside and out and committed them to memory. After the death and Parinirvana of the Buddha, Upali recited the Buddha's rules to the monks assembled at the First Buddhist Council. This recitation became the basis of the Vinaya. Also, like the Sutta-Pitaka, the Vinaya was preserved by being memorized and chanted by generations of monks and nuns. Eventually, the rules were being chanted by widely separated groups of early Buddhists, in different languages. As a result, over the centuries there came to be several somewhat different versions of the Vinaya. Of these, three are still in use. The Pali Vinaya-Pitaka—This version is part of the Pali Canon and is followed by Theravada Buddhists—Scholars say this is the only version that has survived in its original language. The Tibetan Vinaya-Pitaka—This is a Tibetan translation of a Vinaya originally preserved by an early school of Buddhism called Mulasarvastivada. Tibetan Buddhist monks and nuns go by this version. A Chinese translation of a Vinaya preserved by the Dharmaguptaka, another early Buddhist school. For the most part, schools of Buddhism that originated in China use this version of the Vinaya. This would include Buddhism practiced in Korea, Taiwan and Vietnam. 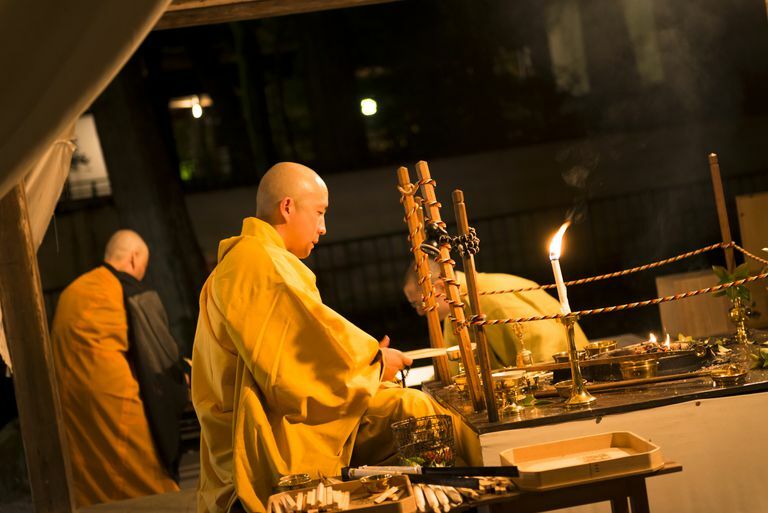 Since the 19th century, however, Japanese Buddhism has followed only a part of this Vinaya. Suttavibhanga: This contains the complete rules of discipline and training for monks and nuns. There are 227 rules for bhikkhus (monks) and 311 rules for bhikkhunis (nuns). Mahavagga: This contains an account of the Buddha's life shortly after his enlightenment as well as stories about prominent disciples. The Khandhaka also records rules for ordination and some ritual procedures. Cullavagga: This section discusses monastic etiquette and manners. It also contains accounts of the First and Second Buddhist Councils. Parivara: This section is a summary of the rules. The Mulasarvativadin Vinaya was brought to Tibet in the 8th century by the Indian scholar Shantarakshita. It takes up thirteen volumes of the 103 volumes of the Tibetan Buddhist canon (Kangyur). The Tibetan Vinaya also contains rules of conduct (Patimokkha) for monks and nuns; Skandhakas, which corresponds to the Pali Khandhaka; and appendices that partly correspond to the Pali Parivara. This Vinaya was translated into Chinese in the early 5th century. It is sometimes called "the Vinaya in four parts." Its sections also correspond generally to the Pali. These three versions of the Vinaya are sometimes referred to as lineages. This refers to a practice initiated by the Buddha. When the Buddha first began to ordain monks and nuns, he performed a simple ceremony himself. As the monastic sangha grew, there came a time when this was no longer practical. So, he allowed ordinations to be performed by others under certain rules, which are explained in the three Vinayas. Among the conditions is that a certain number of ordained monastics must be present at each ordination. In this way, it is believed there is an unbroken lineage of ordinations going back to the Buddha himself. The three Vinayas have similar, but not identical, rules. For this reason, Tibetan monastics sometimes say they are of the Mulasarvastivada lineage. Chinese, Tibetan, Taiwanese, etc. monks and nuns are of the Dharmaguptaka lineage. In recent years, this has come to be an issue within Theravada Buddhism, because in most Theravada countries the lineages of nuns came to an end centuries ago. Today women in those countries are allowed to be something like honorary nuns, but full ordination is denied to them because there are no ordained nuns to attend the ordinations, as called for in the Vinaya. Some would-be nuns have tried to get around this technicality by importing nuns from Mahayana countries, such as Taiwan, to attend the ordinations. But the Theravada sticklers do not recognize Dharmaguptaka lineage ordinations.